A conversation with grantees working to reduce health disparities through payment and delivery system reform. George Mason University partners with Fairfax County and Molina Healthcare, to target disparities in hypertension, diabetes, and cervical cancer among a diverse, multilingual, uninsured population at three safety-net clinics. They have recalculated their billing structure to incentivize care for these conditions, and whole care teams receive performance incentives. At one year in, Scott Cook, PhD, Deputy Director of Finding Answers, asked Principal Investigator Len M. Nichols, PhD, Director of the Center for Health Policy Research and Ethics and Professor of Policy in the College of Health and Human Services at George Mason University, to take stock of the group’s progress and offer some early observations and lessons learned. In the winter of 2015, three very different health care providers partnered with payers to take up the challenge of reducing health and healthcare disparities among their patient populations. One, based in Oregon, aimed to improve oral health in low-income children and pregnant women. Across the country in New York City, a hospital is working to increase post-partum care for low-income women to change the trajectory of their long-term health. A third, in Fairfax County, Virginia, targets the uninsured to improve patient care management for cervical cancer screening, diabetes and hypertension. With the support of grants and technical assistance from Finding Answers, a national program of the Robert Wood Johnson Foundation, these payer and provider partners, include private care providers, county government and a Medicaid managed care organization, are working together to create unique models tailored to their patients’ needs. Dr. Cook: I assume that you were plenty busy before accepting the challenge of designing and implementing a new payment and delivery system to address health disparities. What drove you to take it on? Dr. Nichols: It was the most interesting call for proposals I’d seen in 15 years, to combine payment reform and reducing disparities. I grew up in rural Arkansas, and I think we should all be doing what we can to improve equity. But my day job is to change payment incentives. This combines my experience with my passion. So I thought, why not? Dr. Cook: In a sentence, what is your goal? Dr. Nichols: The goal of the project is to test if combining payment incentives with provider education and motivation to improve key processes of care for specific conditions, can reduce or eliminate observed disparities in a multi-ethnic, uninsured population. Dr. Cook: What would you say is universal and what is distinctive about the project and the patient population in Fairfax? Dr. Nichols: What’s universal is that Fairfax County runs and finances the Community Health Center Network (CHCN), three clinics that treat about 15,000 uninsured patients a year, regardless of their ability to pay. Two-thirds speak Spanish as their primary language and over 1/3 of the remaining patients are from multiple sub-populations of Asian Americans. Many of them don’t speak English as their primary language. What’s unique is that Fairfax has 1.2 million people – it’s big. Its median income is too high to qualify for FQHCs, but we have approximately 100,000 low-income uninsured. The absence of an FQHC constrains what’s possible. This county has stepped up in a way that many don’t. They’ve been running the CHCN for at least 20 years and in various incarnations over the years. They utilize a contractor model with Molina, a large Medicaid managed care for-profit health system based in California that is very good at operating low-income plans and clinics. They run our clinics with professionalism and verve, and have EMR systems with sophisticated back office and customized reports that make performance based QI feasible. That’s unique, but another unique feature for a safety net health system is the way the money flows. Most safety net providers operate within a fee for service model. The county contracts with Molina utilizing a global budget based on the expected number of patients and visits, plus estimated costs for prescription drugs. Molina can take the global budget and design their own model for paying providers. Molina’s existing payment reform program of productivity and quality performance bonus plans, made possible by the budget freedom allowed by Fairfax County, let us hit the ground running in this project. Dr. Cook: How did you settle on diabetes control, cervical cancer screening and hypertension control as outcomes on which to focus? Dr. Nichols: First, we looked at all the meaningful use statistics they had, and the numbers jumped around a bit. You have to be careful and make sure that the data are accurate and reliable. For example, we found out that providers and other staff members were not always documenting key quality data points in the same manner in the electronic health record system. Then, we settled on health conditions where we found consistent gaps; in this case the gaps were between Hispanics and non-Hispanics. We also had to find health conditions with enough patients in at least two ethnic categories so that the monthly data would be meaningful and reliable. For example, we considered addressing gaps in smoking cessation counseling but did not have enough data in one particular ethnic group to allow us to gather and monitor meaningful statistics. It took us a while to work though challenges in the data. We settled on cervical cancer screening, Hemoglobin AIC and blood pressure control. Dr. Cook: And then, how did you identify the disparity targets and modify the system for delivering care? Dr. Nichols: We had to tailor the existing incentive structure to be appropriate to the disparities we uncovered. When we started the exploration with Molina, I asked them if they had ever sorted data by race or ethnic groups. We didn’t have enough African Americans to generate meaningful statistical data, but we could do ethnicity – 5,000 non-Hispanic and 10,000 Hispanic, so we sliced it this way and in every category, Hispanics outperformed. For many years the clinics had taken steps to improve the quality of care for Hispanic patients. However, our Root Cause Analysis showed that when a non-Hispanic patient didn’t speak English as their primary language, there were often challenges making sure that high-quality medical interpretation services were consistently available. This was one of several potential opportunities that we identified to improve quality and reduce the disparities. So it’s not surprising that Hispanics outperformed non-Hispanics. Our next steps are to add a priority matrix and get the patient perspective. Collecting race, ethnicity, and language (REL) data is an important part of reducing disparities, but it is not necessary to put all equity efforts on hold until REL data is available. Participants can use qualitative methods such as surveys and interviews to identify disparities if quantitative data isn’t available. This allows the team to continue to foster a culture of equity across the organization while REL data collection is in progress. Dr. Cook: You mentioned that your group did a Root Cause Analysis (RCA), an exercise often used in quality improvement to understand why a specific undesirable healthcare incident occurred. As you know, Finding Answers recommends using an RCA to assess why a racial or ethnic health or healthcare disparity exists among a particular patient population. 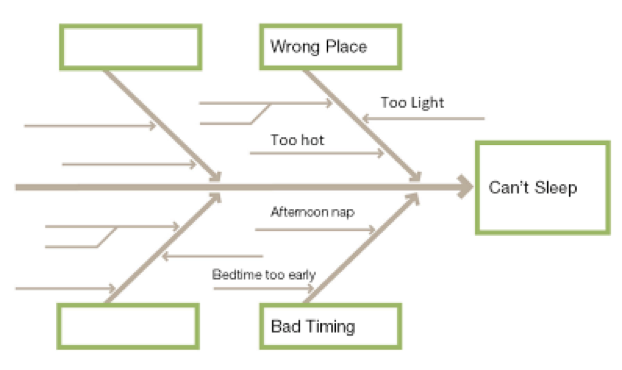 During the analysis you used a Fishbone Diagram, a framework that helps identify and organize the potential causes of a quality problem by drilling down to the specific drivers of the issue. In this case, the quality problems are gaps in care and health outcomes between Hispanic and non-Hispanic patients. You used the Fishbone Diagram, with an “equity lens” to drill down to the specific drivers of each disparity in quality and health. Was the tool useful? Dr. Nichols: Absolutely. The grant started in Oct 2014, and we began by cleaning and analyzing the baseline quality data. We redesigned and rewrote incentive contracts and then launched the intervention in February, so in September, we had six months of data to compare to the baseline. We discovered some movement, but the Finding Answers team suggested inviting providers and other care team members to participate in a root cause analysis of the disparities that we identified. I thought that was interesting. In addition, we did a more in depth analysis of the data. We found significant improvement in non-Hispanic scores in blood pressure, and little variation across the three centers. The staff was fascinated. They got into RCA and fishbone analysis big time. The physician perspective wasn’t always the same as the other staff, but both understood where the other got their viewpoints. And they learned things from each other. For example, most didn’t know they could offer a voucher for a free co-pay for the next visit if the patient completes diabetic nutrition counseling, and that’s a big deal for this population. It came up in a discussion of why some patients are more likely to come back for a return visit or not. The conversation during the RCA revealed how closely all of the staff members watch over and care for their patients. Other issues came to light, like difficulty getting translators, or more patients in some sub-populations more likely to share a phone; which means they don’t always get messages from the clinic. The RCA also pointed up cultural differences. Some patients are reticent or deferential, and we learned about the impact of patients coming from some countries that are grossly under-resourced. For some, the only time a diabetic gets insulin is at the end of life, so they fear being told they have diabetes and they fear insulin as the kiss of death. In other sub-populations, patients will only accept a female provider to conduct a cervical cancer screening and this may limit the opportunities they have to follow-through with the procedure if only male providers are available at the time. Dr. Cook: What challenges have arisen and how are you addressing them? Dr. Nichols: It’s not hard to define the goal, in that the goal is to improve the performance of the group for whom performance is lagging while hopefully improving care for everybody. What is challenging is to link actual rewards to outcome performance because these people are not overpaid to start with and getting improvement in any of these clinical quality metrics requires effort and cooperation by the patient. Many clinicians are nervous about being held responsible for performance dependent on patient behavior. So, we tried to focus more on care processes and help the teams understand that it’s possible to improve gaps in care and health outcomes, even when patient behavior plays a key role. Dr. Cook: Any advice for other providers who want to try to introduce payment or system reform incentives to reduce health disparities? Dr. Nichols: Don’t be shy about asking safety net providers about joining a research project. They are busy and under-resourced, but they’re good people and interested in doing as good a job as they can do, and when they discover disparities are present among their own patients, they are intrinsically motivated to eliminate them if at all possible.